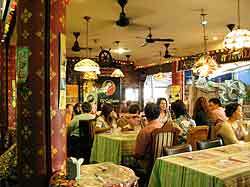 Toh-Plue restaurant, found at Chatuchak Market in Bangkok, serves delicious, flavorful Thai food. 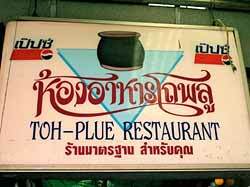 Whenever Kasma takes one of her small group tours to Chatuchak, we always take them to eat at Toh-Plue. 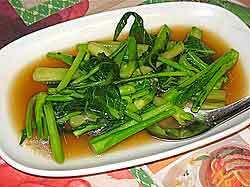 This blog gives my impressions and explores some of our favorite dishes there. Toh-Plue restaurant is found in section 27 of Chatuchak Market and the sign can be seen from the center courtyard. It is open from 8:30 a.m. to 7:00 p.m. on Wednesday, Fridays, Saturdays & Sundays. As much as I love going to Chatuchak – I visit every year on my annual trip to Thailand – it can be an exhausting experience. One reason is the heat: it can get very warm indeed. The second is the number of people crowding the narrow aisles. After a couple hours of shopping I’m ready for a sit-down. One distinct advantage to Toh-Plue is that it is air-conditioned so you can relax in luxurious coolness. 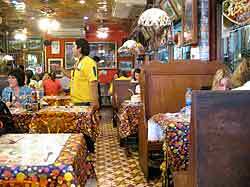 They do get quite a few tables in a small space and there are times when every table is filled. 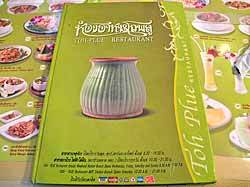 One nice thing about Toh-Plue is an extensive menu that includes pictures of many dishes. They clientele is a combination of Thai and fahrang (the Thai word for Caucasian). They serve good, solid Thai food. 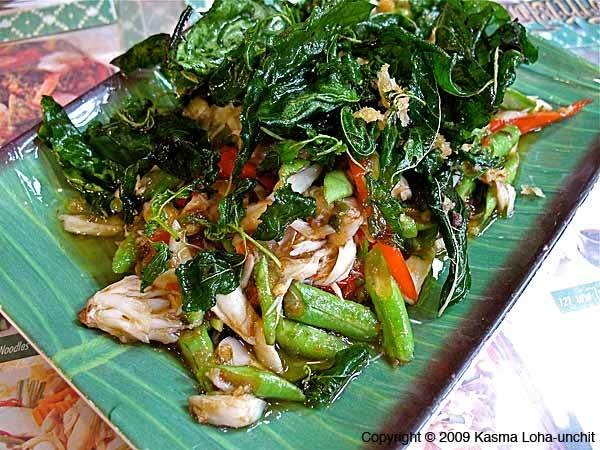 I’ve always gotten the authentic, Thai variety – but that may be because I’m usually there with Kasma doing the ordering and making sure they know we want it Thai-style. One picture is said to be worth a thousand words. 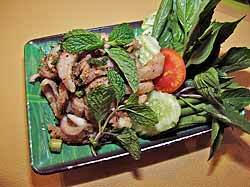 I’m going to just show some pictures of some of the dishes we often order. Be sure to click on each picture to see a larger version. 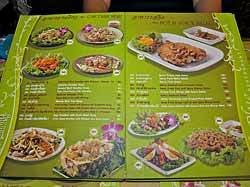 When Kasma and I came to the restaurant on our own in January of 2011, the two dishes pictured above are what we ordered. On the left is a spicy Larb (pronounced lahb) salad made from succulent pork neck with a very spicy dressing that includes (lots of!) chillies and ground rice. 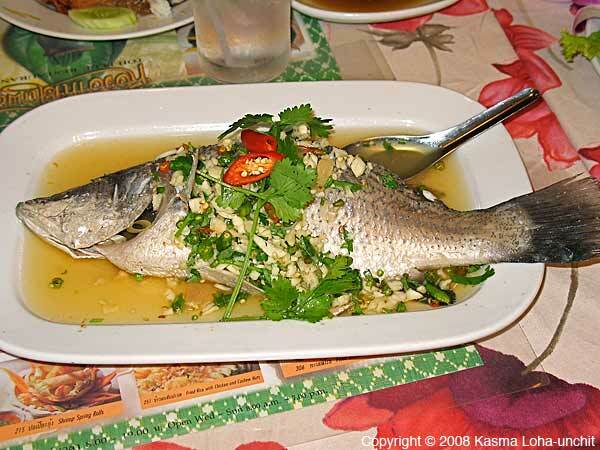 This is one dish I always order here. The menu lists the dish on the right as “Deep Fried Fish and Spicy Mango Salad” (Pla Samlee yum Mamuang). One (of many) things that the Thais do extremely well is fry things; fried food very seldom has a greasy feel or taste – it is simply flavorful. 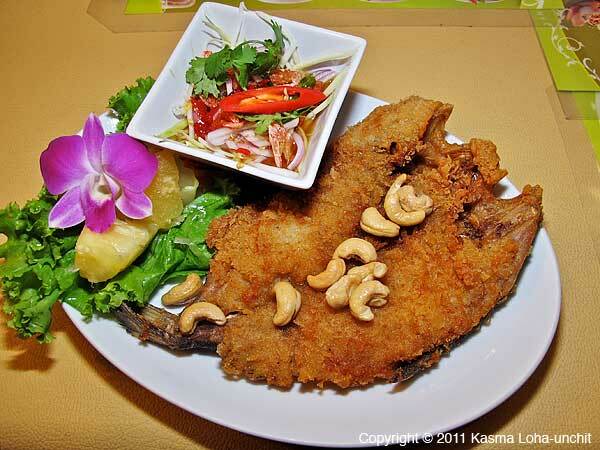 Here, a cottonfish is split open, boned, coated with tapioca flour and fried crispy: so you get the crispy, tasty outer side enclosing succulent, tender fish meat. The fried fish is topped with a spicy mango salad for serving and eating. Here are two more seafood dishes. To the left is a Stir-fried Crab with Basil – the green herb in the picture is basil that has been deep fried. 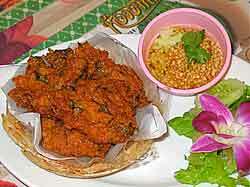 To the right is (in Thai) Tod Mun (pronounced Tawd Mun), a deep-fried fish (or shrimp) cake; it is served with a sweet and sour dipping sauce. They do both dishes very well here. All in all, Toh-Plue is a reasonably delicious restaurant. 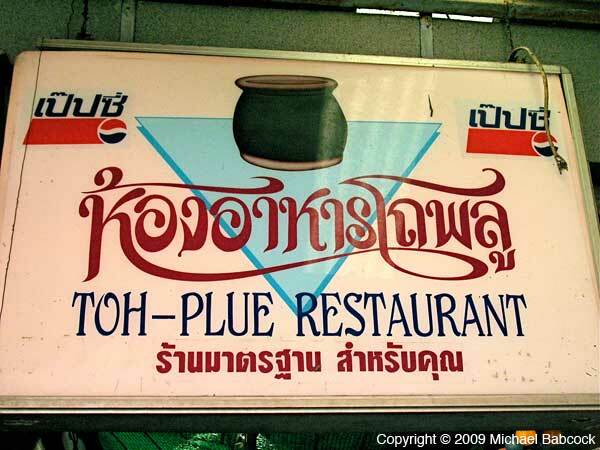 I wouldn’t say it is worth making a special trip to Chatuchak Market, just to eat there; but Chatuchak Market is worth a special trip, so check out Toh-Plue for lunch when you go. 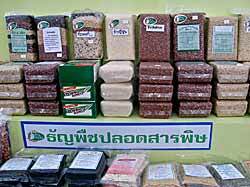 In Thailand, the movement back to consuming whole-grain rice is picking up steam. 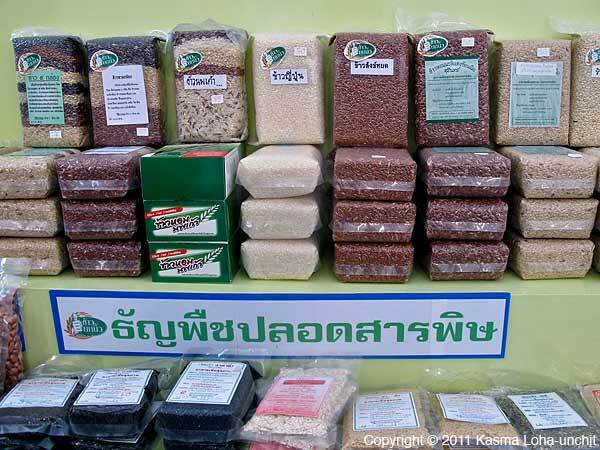 Just a decade ago, it’s almost unthinkable that Thais would ever give up the white rice they have become so accustomed to eating and regard as a refinement of their taste for the rough-and-tumble brown rice relegated to a small subset of the rural population. I recall that in my childhood, my mother would buy whole-grain red rice mainly to feed our pet dogs since it was less expensive. In generations past, before the days of mass cash-crop agriculture for export, farmers grew enough rice just for their own and for local consumption. 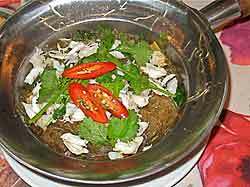 The rice was de-husked by pounding with large wooden mortars and pestles, which retained the bran and germ. But as the country began to emerge on the world stage, government policy focused on increasing agricultural output for export to build up the country’s foreign currency reserves and wealth. Cash-crop agriculture was pushed and this large-scale mono-cropping necessitated the widespread use of chemical fertilizers and pesticides to increase and maintain yields. Government-sponsored field trials selected rice strains with superior attributes to promote for farmers to grow (see previous blog: Thai Jasmine Rice – Kao Hom Mali – Part 2). The advent of modern-day mills came about to handle the large tonnage of rice and standard polishing techniques were implemented to produce grains that were uniform and looked white, long and beautiful as the world market demanded. Because the fragile oil in rice bran could turn rancid easily, removing the bran with polishing enabled exporters to store the large tonnage of rice for indefinite periods of time without concern about spoilage until it was ready to be shipped abroad. This development led to a change in domestic consumption patterns with white rice rapidly replacing hand-milled brown rice as the norm. 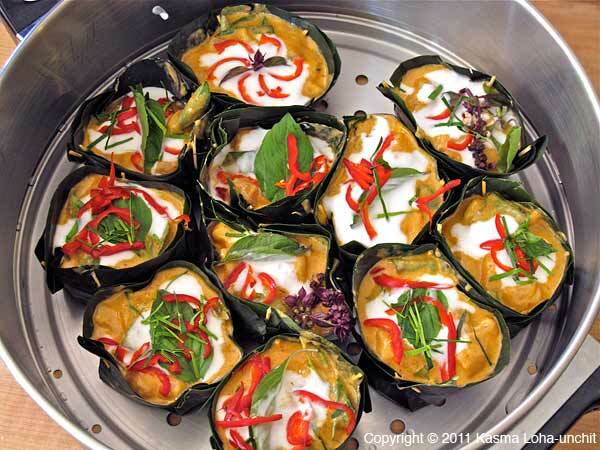 With modernization bringing more sedentary ways of living, Thai people found white rice more palatable as its lightness and easy digestibility better suited their life-style and its neutral, mild taste and softer texture better complimented Thai dishes. Its long shelf life was also seen as a plus compared to brown rice which turned rancid and buggy easily – usually in only a couple of months under normal home conditions in the tropics. 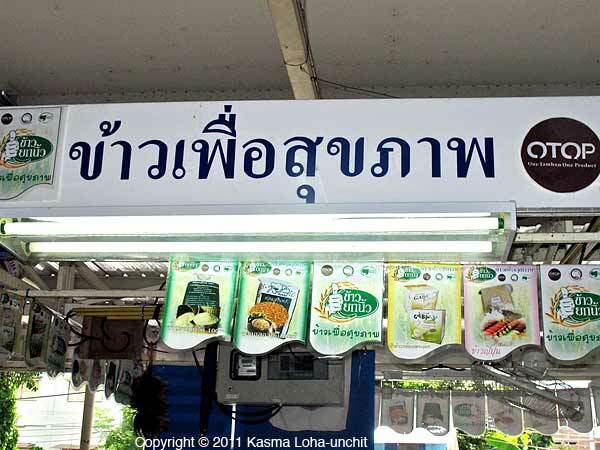 Things have changed quite a bit since then and mostly in the past half a dozen years or so as the health food movement marched in earnest to the forefront, propelled by widespread concerns about the rising incidences of modern-day diseases such as diabetes, heart disease and cancer in all segments of the Thai population. 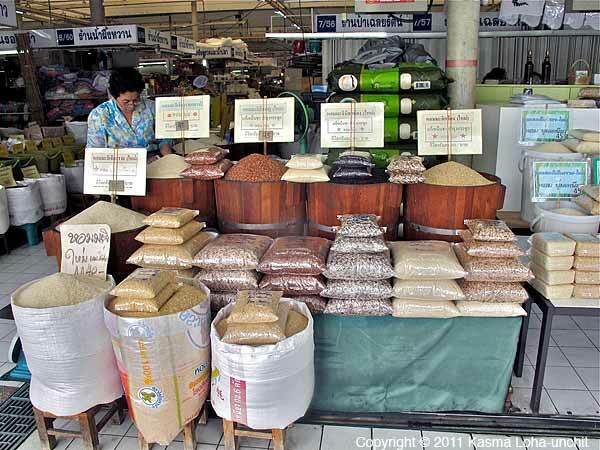 Today, whether at open-air marketplaces with large rice vendors such as at Or Tor Kor (pronounced Aw Taw Kaw), mega warehouse stores such as Makro (similar to Costco), neighborhood fresh markets, or even upscale supermarkets and specialty health food stores in many of Bangkok’s glittery shopping complexes, it is exciting to see many varieties of whole-grain rices on offer in various natural colors, from light brown and pink to deep purple and black, alongside different kinds of polished white rices. They come in big sacks, bulk open baskets or specially packaged kilogram pouches slapped with labels touting the particular grain’s health attributes. 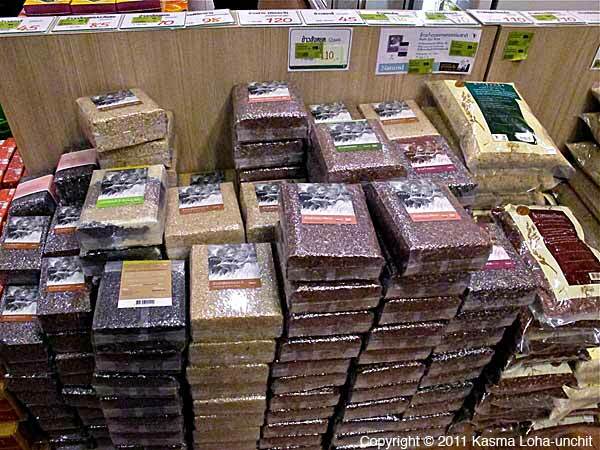 Also on offer are colorful mixes combining several different kinds of whole-grain rices. With research confirming a unique nutritional profile for each kind of whole-grain rice, these mixes are formulated to provide a broad range of nutrients as well as ensure a delicious texture and flavor combination. 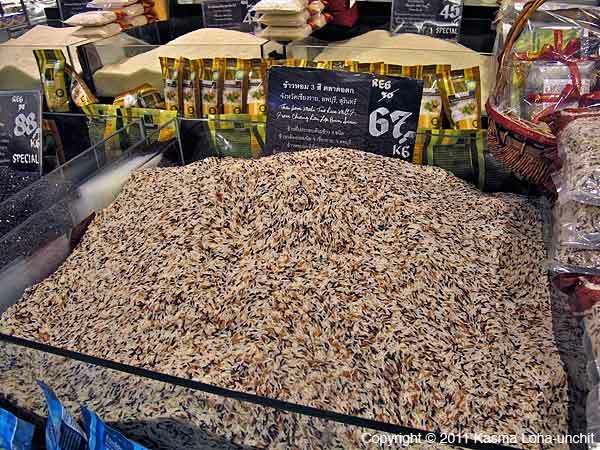 What is astonishing is that the prices of many of these emerging whole-grain rices are relatively steep, especially those grown organically or are heirloom or improved native strains grown only in limited quantities in particular regions of the country. This is a far cry from a decade ago when there was little, if any, demand for them. Sign says "Rice for Health"
Accompanying the health food movement, the past few years have seen the advent of “green” markets — sort of like farmer’s markets held once a week at several locations in major cities. 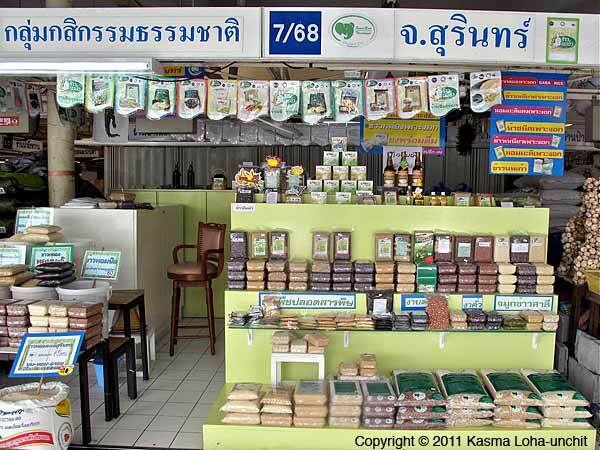 Vendors offer not only fresh, organically grown produce, healthy snacks, ready-made take-home foods, and natural juices, but a wide range of natural products as well, such as herbal shampoos and natural cosmetics, herbal food supplements, and environmentally friendly household products. 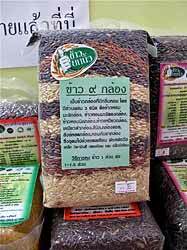 Of course, it is most interesting to me to see the increasing varieties of organically grown whole-grain rices being sold at these markets. 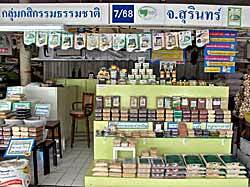 Many of them are particular to micro-climates in different parts of the country and are OTOP (“One Tambol, One Product” – tambol refers to a district in a province) or village products, which earn villagers a good income. 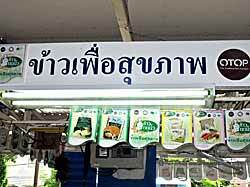 The word “OTOP” usually signifies a quality hand-made product — notice it on the sign of a rice vendor stall at Or Tor Kor (Aw Taw Kaw) market in the above left picture. 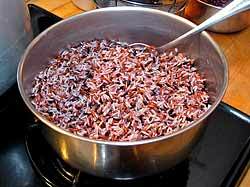 Red rices have been popular among health-conscious consumers since the beginning of the health food movement. 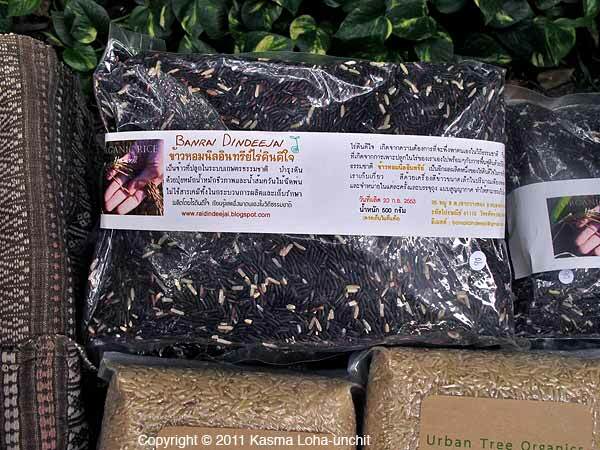 While there are many strains of them grown around the country, kao sangyot has emerged as one of the most highly regarded. 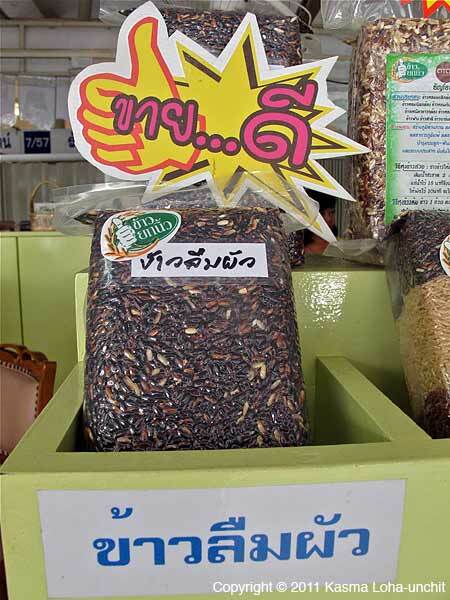 A red rice native to (and only grown in) Phattalung province in southern Thailand, this heirloom variety saw a resurgence in its cultivation about seven years ago when local agricultural cooperatives designated it as a rice to be grown organically for the health food market. With a stellar nutritional profile, demand for it in recent years has surpassed the limited supply. 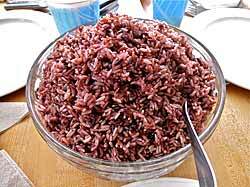 In addition to all the vitamins and minerals found in all brown rices, sangyot red rice is much higher in iron and zinc than other whole-grain rices, owing to the mineral-rich soil and water where it is grown. Red jasmine rice, on the other hand, is particularly high in vitamin E and is said to contain 30 times more antioxidants than common brown rice. 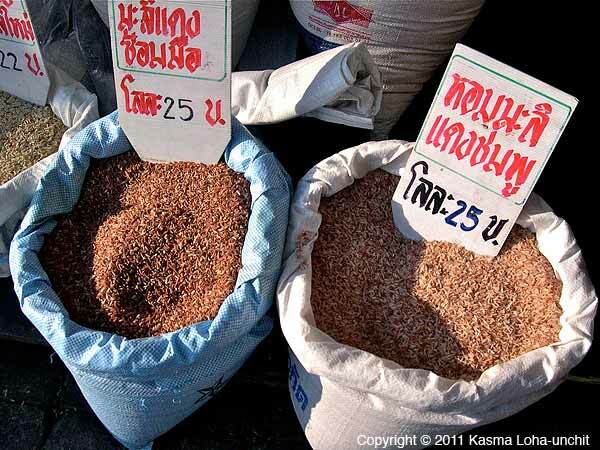 Among the black rices, the most popular is probably kao hom nin or fragrant purple rice. 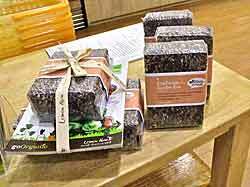 Developed by Kasetsart University (Thailand’s agricultural university), it looks black when raw but is actually deep purple when cooked. It is a delicious rice higher in iron, zinc, copper, calcium, potassium, vitamins A and B than brown jasmine rice. More importantly, it contains a substance called proanthocyanidin. 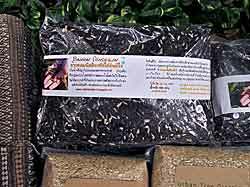 which gives the rice its dark color, and is a more potent antioxidant than vitamins C, E or A. The iron in this rice has particularly small molecules, making it immediately available to the body. The black rices are not only very nutritious but they are full of flavor. Perhaps the most flavorful is a glutinous variety given the common name of kao leum pua — literally “forget husband rice.” I was told by a friend that it got its name because any wife who cooked the rice would find it so delicious that she would eat it all up, forgetting to save any for her husband. 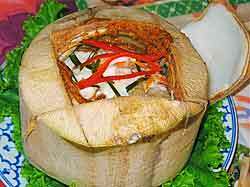 It is an OTOP rice from Surin province and has become very popular. I bought some to try out and found it indeed very delicious. Mixing just a quarter cup of this rice with two cups of brown jasmine rice turns the whole mixture a pretty purple color when cooked and adds so much flavor that it can easily convert white-rice eaters into brown rice lovers. My niece is one of them. She won’t touch brown rice, but when I mix it with the “forget husband rice” and cook it the way I usually cook brown rice (see How to Cook Jasmine Brown Rice for Maximum Nutrition) she just can’t seem to get enough of it! 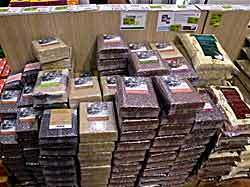 Of course, there are numerous other varieties of very nutritious native whole-grain rices. Books (in the Thai language) have been written about them over the past couple of years. I am still looking for some of them in the rice markets, health food stores and “green” markets. 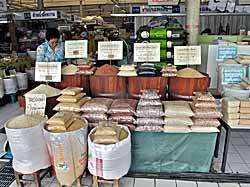 Perhaps as more and more people are awakened to the health benefits of consuming whole-grain rices, many more varieties of these rices will become readily available. 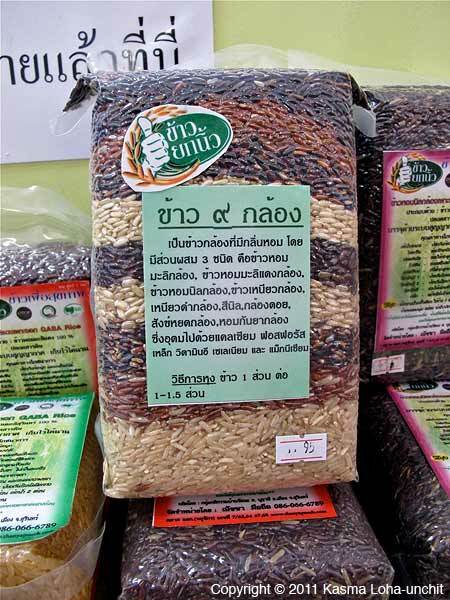 For me, consuming these native whole-grain rices not only contributes to my health but it, in turn, improves farmers’ earnings and helps return them to a more harmonious way of living on the land. Written by Kasma Loha-unchit, December 2011. 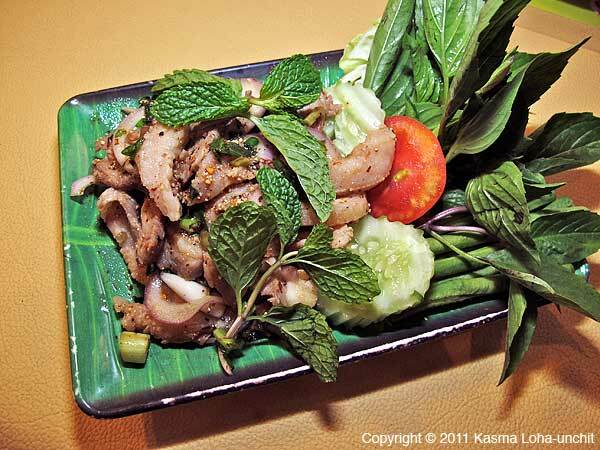 You are currently browsing the Thai Food and Travel Blog blog archives for January, 2012.